Very good article on 9 things that developers want more than money. When I read through the list they all held through for me. Microsoft have released an add on for Microsoft Office 2007 to enable you to save files as PDF and XPS. There was already free third party solutions for saving pdfs, e.g. pdf995 but this one is officially from Microsoft. Jon Flanders (software engineer and instructor at DevelopMentor) will be presenting on Windows Workflow Foundation.Â Built into .NET 3.0 WF can help you build workflow-enabled applications that give you visibility into your processes, as well as the potential for extreme extensibility. This is the last talk of MTUG Cork for 2006 and is taking place in the Imperial Hotel on 11 Dec at 7pm. The talk is free but registration is required. Limitations: You can’t extend all volumes, I had trouble trying to extend the system/boot volume. According to a Microsoft Knowledge Base article you can’t extend a volume if the system page file is located on the partition. You could try to move the page file to a partition that you do not wish to extend. 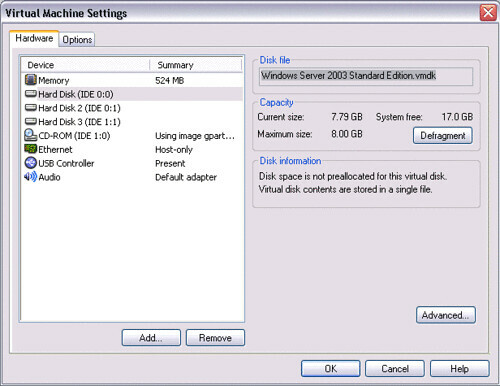 Add a new disk to the VMWare image (the size should be that which you want to allocate to another volume, in this example 6GB). A wizard should be displayed to initialize and convert the new disk. If you are not prompted then you may need to Rescan. Do not assign a new volume at this stage. You need to convert the D drive and the new drive to both be dynamic disks. Once both the drives are dynamic, then right click on the D drive and select Extend Volume. Follow the wizard to allocate the new space to the D drive. Once you complete the wizard, the D drive should now be 10GB. That’s method 1 complete. If this worked for you, great! If not then take a look at Method 2 below. Advantages: You can successfully expand a system/boot drive. If the Vmware image is running, shut it down. that you want to expand. The disk file field on the right hand side will display the name of the .vmdk file. You need to remove any snapshots present in the Vmware image. Note: By deleting the snapshots the system still remains in its current state. Open up a command prompt and issue the following command: vmware-vdiskmanager -x 12GB “Windows Server 2003 Standard Edition.vmdk” where 12GB is the desired size of the expanded volume. You should see something similar to the following screenshot. The disk has been expanded but the new space is as yet unallocated. Now in theory you should be able to use the Windows diskpart utility to allocate this space but this would not work on a boot/system disk for me. You could use Knoppix (free) to allocate the new space to the C drive. Knoppix is a bootable Live Linux CD and it happens to have a utility called QTparted. Since everyone likes free stuff, I went with Knoppix in this case. Download Knoppix (the iso image) to the machine which hosts the VMware image. Now you need to point your CD/DVD drive in your VMWare image to the iso image. How do I do this? Reboot your VMware image and have it boot from the cd drive. You may need to modify the BIOS settings in order to change the boot order to have the system boot from the CD drive. The exact settings that you need to modify will depend on the exact BIOS that you have. It should be straightforward to change this. After Knoppix boots , start at the large letter K at bottom left. Select K | System | QTParted to launch the utility. 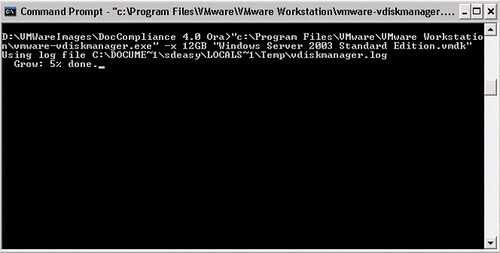 You will see the list of disks within the VMware on the left hand side. Selecting one of these disks will provide you with more details about that disk. In the following screenshot you can see the C drive with the 8GB allocated and the 4GB unallocated. Right click on the drive that you want to expand and select Resize. A dialog will be displayed and you can expand the allocated space by dragging the partition to the right. You could also type in the values into the textboxes. After allocating all the new space you now see that the total size is approx. 12GB. Click OK to exit the dialog. At this stage you have not commited the changes yet. Go to the main menu of QTParted and select the Commit option. The following prompt will be displayed. Choose Yes to commit the changes. You will see the following two screenshots as it commits the changes. Now, shutdown the Vmware image and boot back into Windows (you may need to change the boot order to accomplish this). Don’t be alarmed if CHKDSK wants to run some tests on your drive. It detected the changes you made in Knoppix and wants to verify that everything is ok.
You may need to restart Windows again because it will have detected new hardware. Once Windows is back up, go to Disk Management (Administrative Tools -> Computer Management -> Disk Management) and you should now see that the C drive has the extra 4GB as promised. 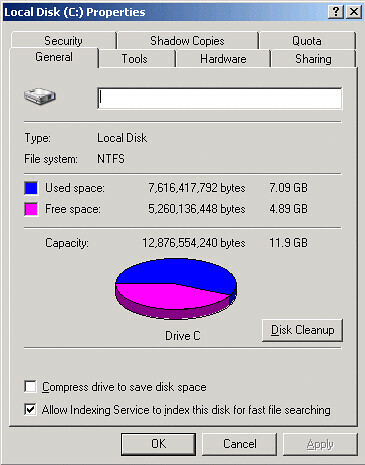 When you are creating future Vmware image make sure to allocate plenty of space to the drives. You can set that they only grow as required so they only ever take up the space that you require at any point in time.